Got a reservation or two about Okamiden. Namely that it's on the DS (was hoping for PS3), and that it's not Clover (well, Platinum) making it. 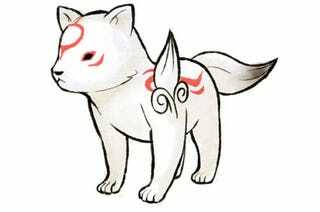 Got no reservations, however, about how damn cute the new hero, Chibiterasu, is. Look at him! My heart melts just thinking about looking at him. Or her. Probably, her, actually, but until we get a good "rolling on its back" shot, the jury's still out. The above cuteness is courtesy of a new set of screenshots and artwork from the latest issue of Famitsu, which you can snuggle up to below.